Readers who pay attention to this blog will notice that I haven’t been. Well, not very much lately anyway. Since the end of summer, it has been pretty mad at the day job, and after a few months of rapid-fire tastings during the warm months, it seemed a good time to cool down for a bit. And go on a diet. Lost five kilos, thanks for asking. 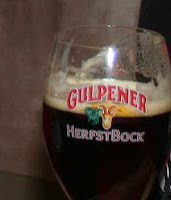 But somewhere in the blur of life that was October -- at a moment when I was off in the Dutch countryside at a staff retreat, in fact -- I did manage to try a new beer, Gulpener HerfstBok, and took some notes too. I’ve had good experiences with the beer from this brewery in the Limburg region of the Netherlands. From their Gulpener Limburgs Land Premium Pilsner to their Gulpener Korenwolf to their Gulpener Winter Vrund, it’s always been a happy tasting. So, when the retreat centre said they could procure some bottles of their HerfstBok to avoid us having to drink the bar’s paltry selection of draft offerings, I happily agreed. Gulpener HerfstBok is an autumn beer, as you may have guessed from the name. It pours a seasonally appropriate reddish-brown, and the taste is rich without being overpowering. Malt mixes with baked cherries and apples and maybe even blackberries, evolving into a solid hop bitterness. At 6.5%, it’s more a brisk and bracing walk through piles of fallen leaves than a fireside warmer. If it has a downside, it might be that it is just a touch too sweet. However, I often say that in my tasting notes, so by no means let my hypersensitivity to sweetness put you off trying this one.